celebrate with the Sam Maguire Cup. They don’t do things in half measures in Donegal, so it should come as no surprise that Sunday’s All-Ireland final win over Mayo was shrouded in controversy. The derision didn’t arrive on the scene until long after the final whistle was blown against Mayo to be fair. By then a man of the match performance from Donegal captain Michael Murphy and a resolute backs to the wall approach had seen off a second half attempt at a revival by Mayo. To be honest, the result was no surprise. Once Dublin had decided not to really defend their All-Ireland crown this season, Donegal always looked the team most likely to succeed them as Sam Maguire winners. All year they had amended the puke football tactics that marred their 2011 season and looked like a side intent on winning the All-Ireland under Jim McGuinness at the second time of asking. In the semifinal victory over Cork, Donegal even looked like a side capable of open and attractive football. It was a myth of course. Boosted by early goals from the talismanic Michael Murphy and Colm McFadden inside the first 10 minutes on Sunday, Donegal were never in any real danger of losing the 2012 All-Ireland final. Mayo huffed and puffed, as Mayo teams always do, but there was never really any danger of the Connacht champions upsetting the Ulstermen in their desire to bring Sam Maguire north on Monday night. In fact, the only surprise of the weekend was the manner in which McGuinness reacted when his team won out at Croke Park on Sunday afternoon. Minutes after the final whistle sounded on his team’s deserved win over Mayo, McGuinness entered the press conference room that lies deep beneath the Hogan Stand. The purpose built enclosure houses a top table and seating for abut 30 to 40 journalists, all eager to listen to the thoughts of those involved in matters of the day on the Croke Park playing fields. Last Sunday, as is traditional on All-Ireland final day, the Mayo boss James Horan was first in to describe how his team had managed, yet again, to blow the biggest day of their careers. Horan, as is his wont, was as honest as the day is long, and admitted that his side were naive in dealing with a Donegal onslaught that saw them concede two goals in the first 11 minutes. He was also brave enough to suggest that this current Mayo side were big enough to learn the lessons of last Sunday, something Mayo fans have heard many times in the past before, most often in defeat. Minutes later, McGuinness entered the media conference area and scanned the room. Those who were there told me he scanned the audience in front of him, looked at his palms and then took his leave of the Croke Park press room. Before he returned, McGuinness demanded that a journalist by the name of Declan Bogue leave the room. Now I have to admit that I don’t know Bogue from Adam. I know he wrote a book about Ulster GAA last season that cost Kevin Cassidy his place on the Donegal squad that went on to win the All-Ireland football title. I know that the book allegedly revealed state secrets about the way McGuinness went about his business as manager of the Donegal footballers. But I can’t tell you for rhyme or reason why McGuinness got paranoid about Bogue’s presence in a Croke Park press conference last Sunday. Jim should have been bigger than all of that. He should have realized that he had just sent Donegal fans to the promised land by winning the All-Ireland final against Mayo. McGuinness was a player when Donegal last won the Sam Maguire in 1992. He was the manager when they won the All-Ireland again in Croke Park last Sunday thanks to a four point win over Mayo. Nothing else should have mattered for anybody from Donegal, most especially the manager of the football team that had just beaten Mayo in the All-Ireland senior football championship final. 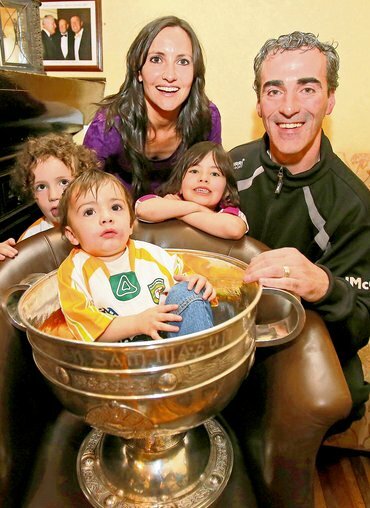 Jim McGuinness was the right man to lead Donegal to the Sam Maguire in Croke Park last Sunday, but he was so wrong to settle scores with a journalist after his finest hour. SOCCER: Ireland manager Giovanni Trapattoni was set to name his squad on Wednesday for the visit of Germany next month and few surprises were expected. Keith Fahey was due back after injury and Richard Dunne was due to be named despite his recent problems with a knee problem. What’s undeniable is Ireland’s need to take at least three points from the October fixtures against Germany and the Faro Islands. Anything else will be seen as a failure. GOLF: All eyes on this side of the Atlantic will be glued to the television on Friday when the Ryder Cup kicks-off in Medinah and for once Rory McIlroy’s nationality won’t matter. He will be a European this week and that is all that will matter in the bi-annual clash with the Americans. As far as Irish golf fans are concerned, Rory will be one of us in Chicago and good luck to him. HURLING: The Galway and Kilkenny camps have done their best to downplay Joe Canning’s comments about Henry Shefflin ahead of Sunday’s All-Ireland hurling final replay, but Joe’s decision to accuse Henry of gamesmanship in the drawn game can only act against the Tribesmen on Sunday. Don’t bet against Shefflin making Canning eat his words in the replay this weekend. SOCCER: Neil Lennon made more than one reference to his admiration for Donegal boss Jim McGuinness when he attended the All-Ireland football final last Sunday at Croke Park. Rumors have abounded that McGuinness could end up working for Celtic. Don’t bet against it. SOCCER: Stephen Ireland broke his arm playing for Aston Villa against Southampton at the weekend. I guess that means he can’t figure for Ireland against Germany next month. Not that he would want to! MICHAEL Murphy didn’t just emerge as Donegal’s captain and leader on the day they won their first All-Ireland title in 20 years -- he also emerged as a real leader for a team and a county waiting for a breakthrough in sporting terms. Murphy wasn’t just the man of the match on Sunday, he was the inspiration for a county in dire need of a new beginning. Michael Murphy delivered on all fronts. LIVERPOOL lost to Manchester United at Anfield on Sunday, which won’t come as news to anyone. Nor will the fact that Jon Jo Shelvey got sent off for a reckless foul on Jonny Evans. What was wrong was the way Shelvey reacted on a day dedicated to memory of those who died at Hillsborough. To argue with Alex Ferguson, as Shelvey did, was a disgrace to the Liverpool shirt.